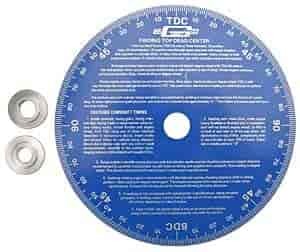 JEGS 81622 - Precision Cam Degree Wheel 11"
For the professional engine builder, these degree wheels are mandatory for accurately measuring several timing functions of an engine: camshaft centerline, valve timing, TDC, BDC, etc. Marked in easy-to-read one degree increments, these degree wheels are made from heavy gauge metal for long-lasting use. You could use this to time the engine, but all you need is a mark on the harmonic balancer to line up with the timing tab for the timing chain cover.